Last February, we had a bit of unusual snow for this corner of the world, and I took a nice long walk in it, shooting all the old cars in my neighborhood. I awoke at 5:30 this morning to the sound of cracking wood. Rolled over and ignored it. 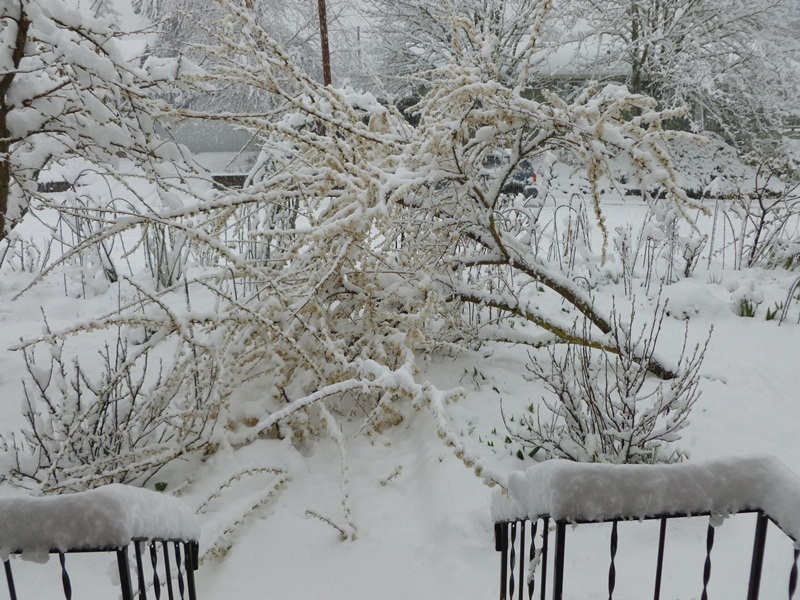 But then there was more; looked out the window, and there’s some six inches of snow, and it’s coming down fast. 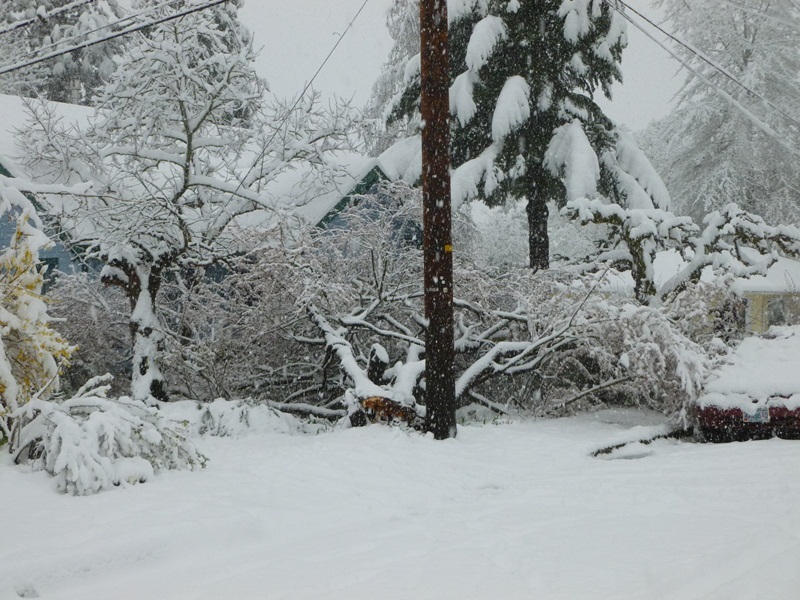 The first thing on the agenda was to get the very heavy snow off our other trees, and my rickety “shed” roof over my stored recycled wood. But eventually, we strapped on our cross country skis to check out the neighborhood. This was just around the corner. and half of the ancient apple tree that predates the house, when the neighborhood was an orchard. Let’s look for some cars. Classic Eugene: W123 Mercedes and Volvo 245. They get an award. Curiously, it’s a 280E, not the ubiquitous bio-diesel. A lady bug out this early? Well it is the first day of spring. 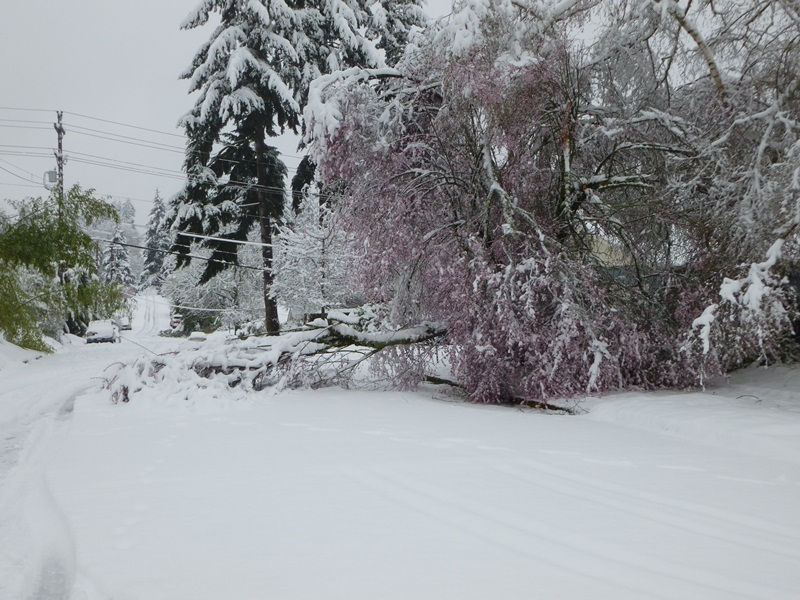 We skied over to my rental houses to check on things there, and by the time I shook off snow on dangerously loaded branches, I was soaking wet and tired. We came back, and I didn’t bother to shoot more cars. My next-door neighbor’s red Camry just barely got spared. 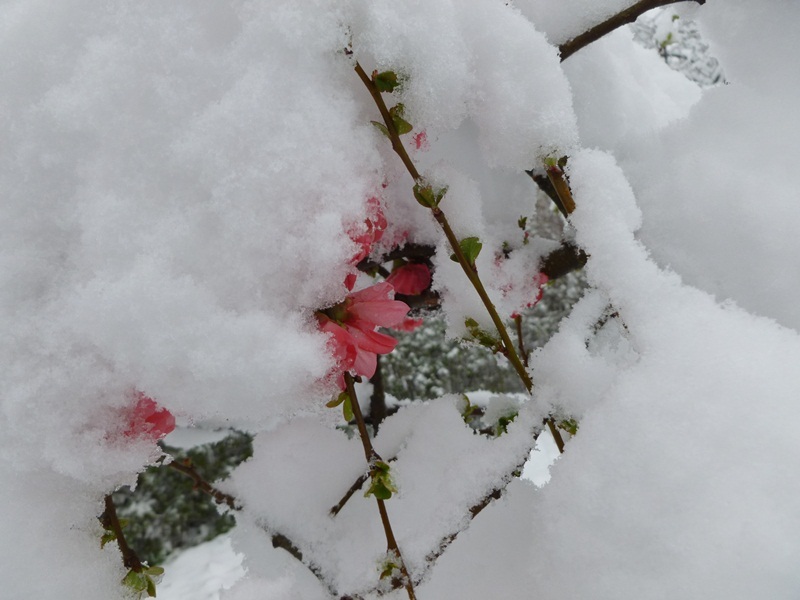 The blossoms on the trees are partly to blame; they trapped much more snow than bare branches would have. 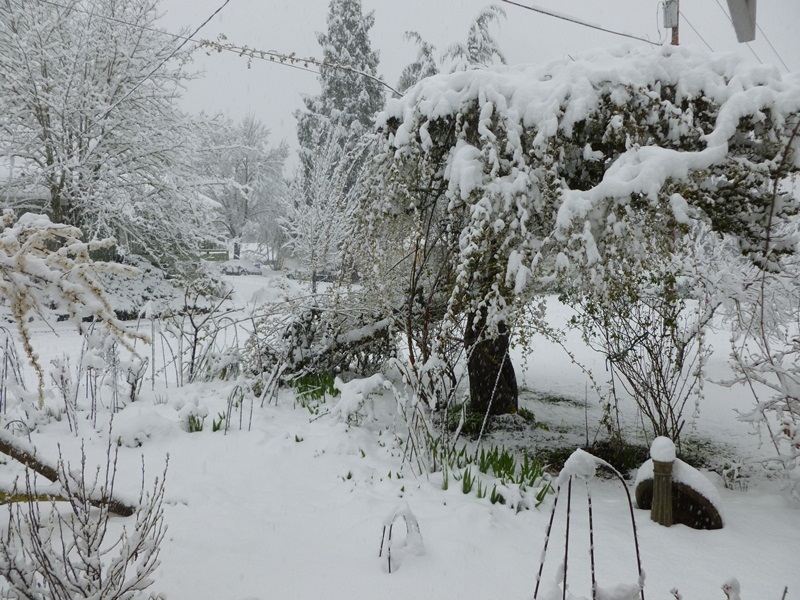 Well, enough of that; some of your are sick of snow anyway, although it seems that much of the rest of the country is having a crazy warm spring. Time to come in, warm up, and get to writing up a GM Greatest Hit that I just found the day before. Stay tuned. Meanwhile, the snow is melting fast, as it usually does here. Especially if it’s Euro-spec. 185 horsepower and twin cams in 1981 was practically futuristic in 1981, even if the rest of the car was shared with the stodgy but ultra-durable W123 diesels. I’m pretty sure none of them in the states were the 185hp M110 6 because in that unfettered state they wouldn’t be emissions compliant in most states. It think most (if not all) sold in the US were 141-145hp detuned units. They’re a bit sleepy/not torquey off the line (thanks 2nd gear start/super short Low 1st gear in automatic models) but they come alive around 30 and pull strongly (with lovely sounds) til about 85mph (I have no clue because mine doesn’t have a tach). They’re definitely “Drive me all day at 95mph, please” cars/engines. It would have been interesting if the unfettered M110 was sold here though, at 185hp it’s barely weaker than the Euro Spec 3.8L V8 (201-215hp). I’ve seen a few grey market 280E’s for sale with the “Euro spec” engine in various EBay searches. Grey market R107 280SLs are more common, and some of them even have stick shifts. Yes, the US units lost the peak of their rev band, lowering max output. But that can be rectified! One of my most serious MM mobiles is a W113 230-250SL with a properly tuned M110 (say 200 hp) swapped in and backed by the (rare) five speed stick. May sound like blasphemy to replace the original motor, but then the DOHC engines were really the same block, just a new head, so why not. They look good too. And the W113 can certainly handle the extra power. Are you trying to egg me into a resto-mod project Mr. Niedermeyer? I do miss having a 200+hp car…. Just comfort yourself that HP rating is only half of the story. Torque is just as important, if not more. In one day, you got more snow than I got in Indiana got all winter! Here? Sunny and 85 degrees. Thanks for asking. Sorry about your trees, though. WTF is going on? I’m not sure I could take 85 so suddenly though. Last I heard, the jet stream was moving very sloooowly and thus letting the weather patterns run for a long time. That little warm spell turned into a long one, while we got to shovel snow off the deck the first day of spring. Driving through the forest yesterday was highly entertaining, though not exactly fun. 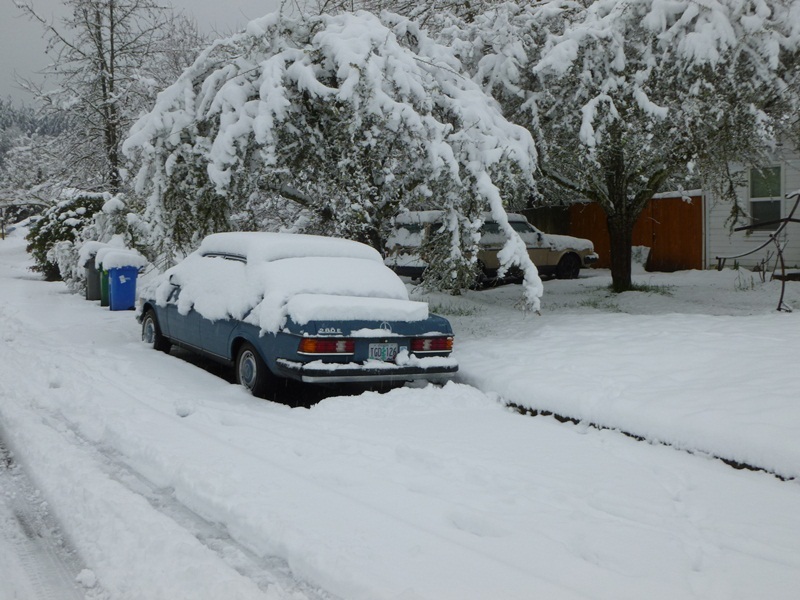 Curiously, I needed to get into town to pick up next winter’s studded snows for the Subaru. Yeah Tirerack! Looks like I need to check our trees tomorrow AM. Lots of wind, though the snow all melted yesterday. It broke 80 here in Bostonia too. Thanks for doing our shoveling, Paul! 🙂 Though tree damage is no fun, that is too bad. 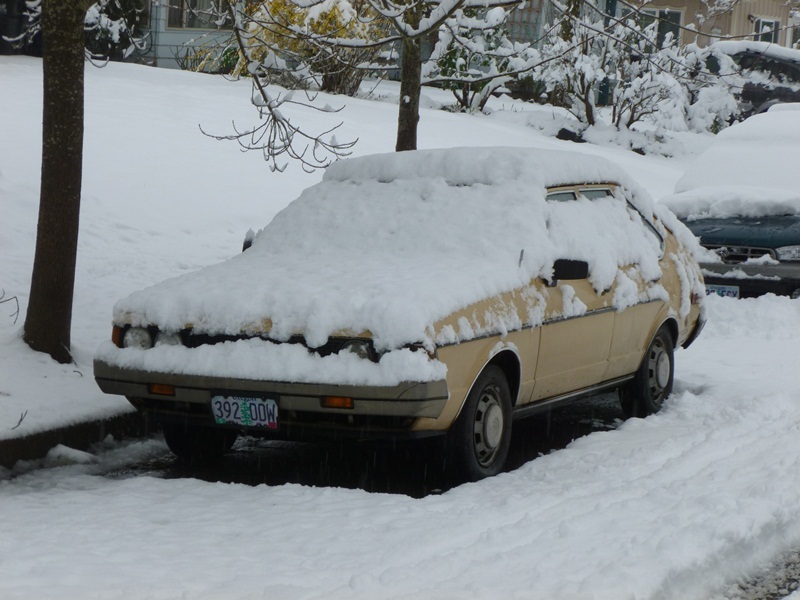 Just curious- how did you drive in that snow without snow tires? Did you read the part where he said that he was on cross-country skis? And regarding the wacky weather, It’s hard to imagine it being much, much colder in the Pacific Northwest in March than it is in the Midwest! I went to college in Flint, MI for two years and I recall the furnace still running for most of June. This is not fair. 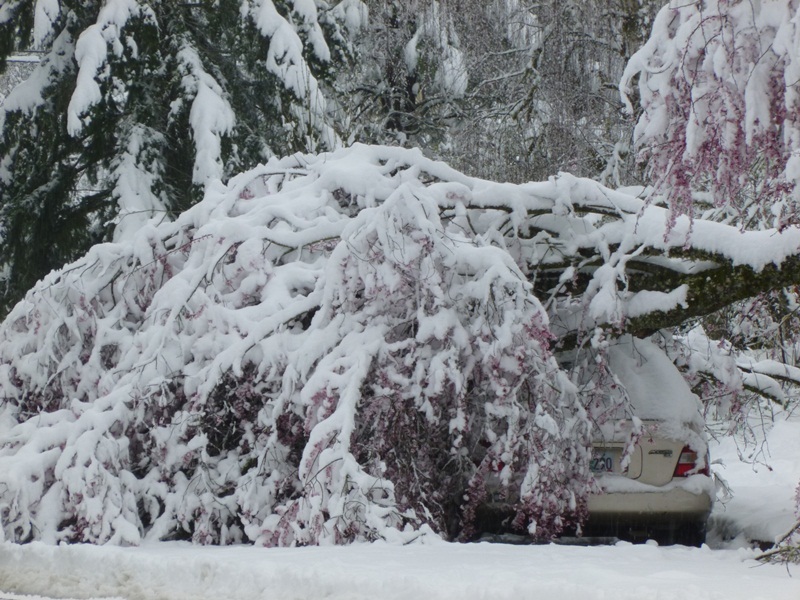 Seattle hit 48 today while most of the Midwest was 30-40 degrees higher. At least we had some sun. 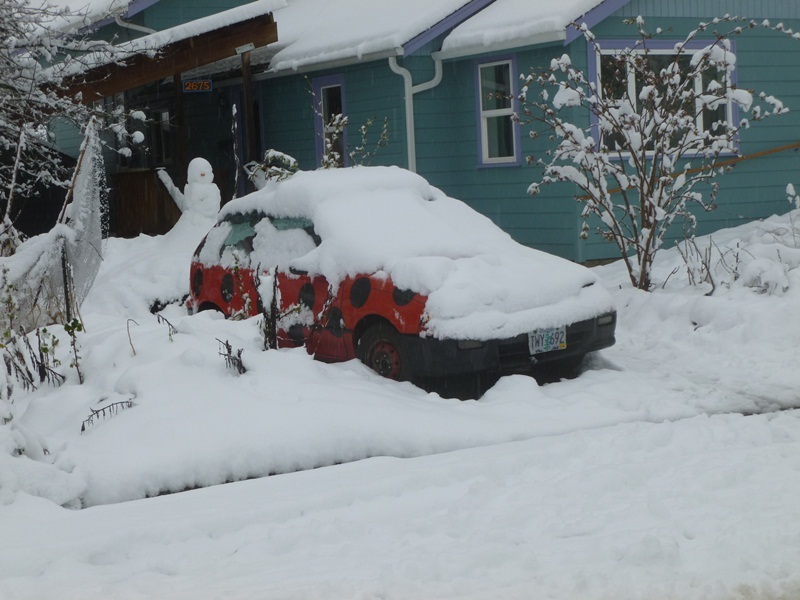 Someone had time to build a snowman behind the ladybug. 85 here in MI today. I’m already complaining about the heat, and it’s still March. it was warmer in Seattle and we even had some sun today. We’ve had record highs this week too in Atlantic Canada. It has been hovering around 25C (80F) for the past 3 days. The normal daytime highs this time of year are around 0C (32F). I’ve never had my snow tires off of my vehicles this early and I am already longing for camping season. I was getting swarmed by mosquitoes last night in my driveway. They usually don’t arrive until May! I can say that driving with the windows down and the sunroof open in March is weird, but oh so wonderful.